About 3 weeks ago I purchased new rubber boots for my CV joints and went on to fit them. I was not able to record it because I did not have an assistant and those familiar with it will tell you how much of a messy job it is! But you could look at Tom’s VW pages for the procedure. Since installing the CV joints back I have been hearing a clunking sound while starting to move and while changing gear. I figured it was something related to what I had done with the CV joints and rather stupidly, I just prayed that the van lasts until the weekend so that I could fix it. The weekend came and I was forced to travel out of town (not with the van). On Sunday night when I returned from my trip I got into my van to drive home and the van just did not feel right. There was very low power and the clunking was even more pronounced. So somewhere along the way, in the darkness, I heard a loud snap and watched my rev counter shoot up while the van was in gear and none of that power was being translated to motion. 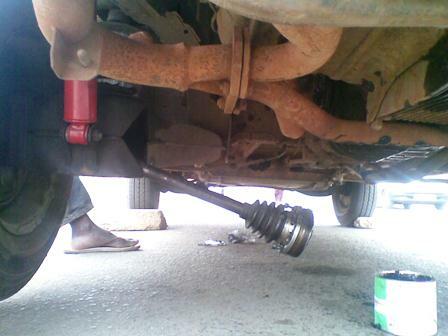 It is then that I knew what had happened – the inner left CV joint had come off! Inner left CV joint off! So I managed to roll the van to the nearest place with light, found a great guy to watch over it and called up my friend Eric for a ride home (not a happy man after being woken up!!). Next day I got to assess the damage as you can see in the picture above. Problem was, after servicing the CV joints, I did not torque the Allen keys that fasten the joint to the transmission hard enough. So in the course of driving they were loose and popped off! I also took the opportunity to torque the Allen keys on the right-inner CV joint as well. While driving in the wilderness of Olepolos, en-route to Magadi, I heard a clunking sound again and before I could find somewhere to stop, a loud racket and loss of power. Guess what? It was the right-outer CV joints that had now come off. So I got down to business, with family watching and cursing my ‘old’ car I wasted 2 hours of their precious weekend pulling out the joint, tightening it and putting it back. So the moral of the story is, the Allen keys on the CV joints are never too tight! That of course if for those of us with no torque wrench yet!